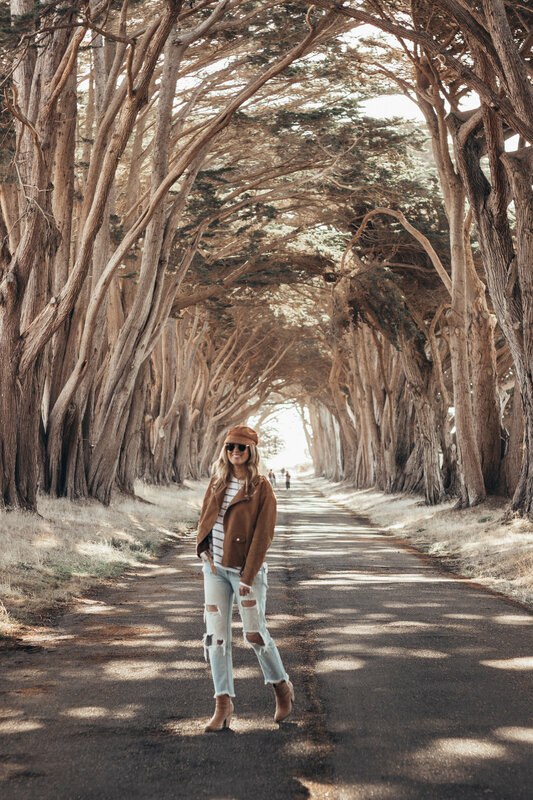 The Cypress Tree Tunnel has been on my SF Bucket List for quite awhile and Warren and I finally made the trip out to Point Reyes a few weekends ago! It really isn't too far from the city - about 50 miles - so it's a perfect day trip for a little weekend adventure. We woke up pretty early that Saturday morning as we wanted to beat the crowds and see the tunnel in it's full glory! 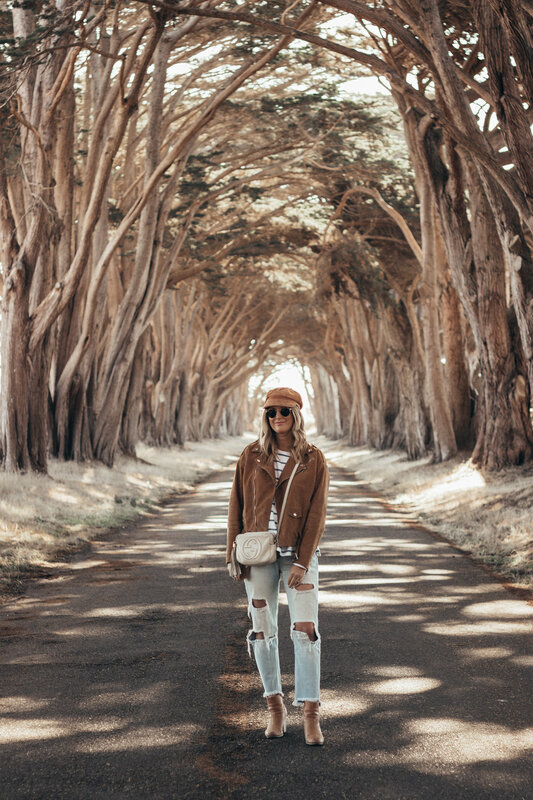 We were pretty lucky and there was only about 1 other couple there who didn't stay too long so we ended up having the tunnel to ourselves :) It's truly a sight to see and something I highly recommend visiting if you're a Bay Area local! 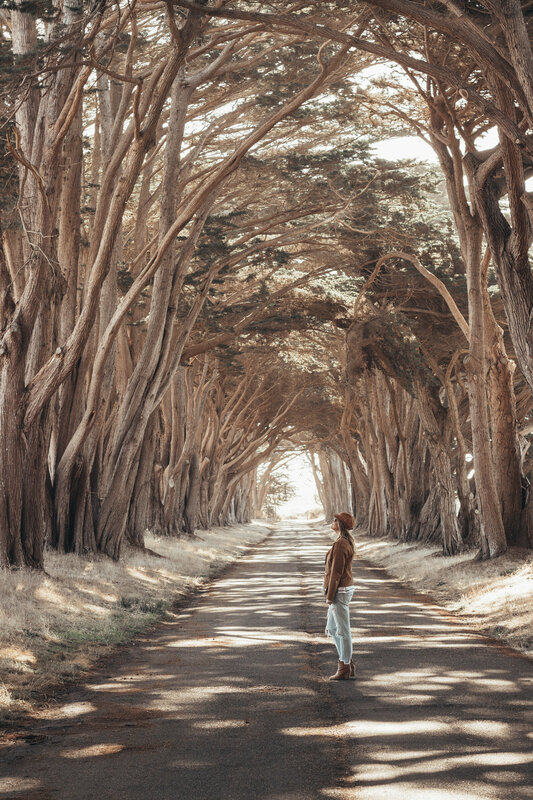 After visiting the tree tunnel, we decided why not to just go ahead and make the trip out to the Point Reyes Lighthouse since we were out in that area anyway. Stay tuned for another blog post featuring those stunning views! I wore my favorite pair of distressed boyfriend denim, my go-to striped tee, and the coziest of suede leather jackets. I finished off my look with one of the trends of the season: a paperboy cap. I know it's not for everyone but I personally think it's a cute alternative to the floppy hat! Sometime those feel so "extra" and I like how the paperboy caps are not so loud if that makes any sense! Warren wasn't too keen on this hat and kept calling it my spice girls hat - haha! Shop my entire look below! Hope y'all have a great week! This will be a fun one as Warren's 28th birthday is on Wednesday! Can't wait to celebrate him!